As master Boat Builders – Johnson Yachts International Limited predominantely builds high quality one off custom sail and motorboats for both local and overseas clients. Its sister company Johnson Marine Boatbuilding Limited is very passionate about traditionally crafted classic boats and has spent many years focused on servicing the requirements of owners with repairs, maintenance and alterations on such classic vessels. Johnson Yachts International Limited are proud to have built two Benford Design Group designs and also had a close working relationship over the years with New Zealand renown boat builder and designer, Max Carter. Johnson Yachts International has recently been invited to join the new “Destination New Zealand Superyacht Refit” group, a market recently recognized by the NZ government as fast becoming a major growth area and, standing with the Superyacht builders, is heading towards becoming NZ’s 5th largest export earner. Johnson Yachts International has recently celebrated its 10th year of operation, with its owner Graham Johnson, well into his third decade within the boat building industry. Grahams boat building career began at “Jack Stone Boats” in 1977 surrounded by boatbuilding and design legends such as Jim Young, John Senior, Phillip Wilson, Max Carter and Laurie Davidson. In 1981 Graham received his Trade certificate during the building of the “Wanderer V”, the last boat built for the world renowned cruising couple Eric and Susan Hiscock where he was put in charge of construction. 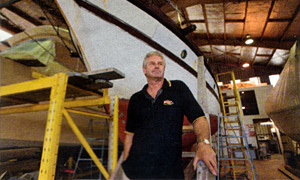 With time spent in the Northland and Auckland boat building sectors, Graham founded Johnson Yachts International at Pine Harbour Marina in July 2000.